Wild rats and other rodents are a part of the Lao diet for some, more so for those in the rural parts of the country. In Laos, there's a strong belief that animals obtained from natural environments, whether it be the forest, jungle, or one's farm land, are considered a clean and healthy source of animal protein - no different than hunting other game. Having said that, in Laos there isn't the same negative attachment to rats that exist in western countries where its believed to be a dirty animal that carries disease. The wild rodents found in Laos are quite different from the house mice and the rats found in the streets and sewers of North America and Europe. 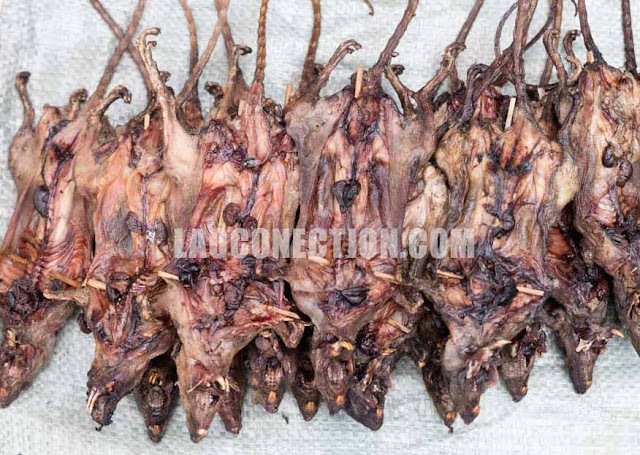 For example, the ones that are consumed for meat in Laos are often larger species of rodents that are nocturnal forest foragers that typically eat plants, fruits, small vertebrates, and insects. Would you ever try eating these?